First Presby, David, sent me this link to Grace Cathedral in San Francisco. Here you will find interviews with different spiritual thinkers and questers. 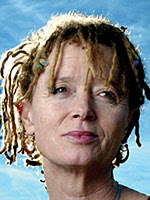 You will like Anne Lamott. Here is an interview to read as well. "You can be pretty sure you've created God in your own image if you find He hates the same people that you do." I love that quote almost as much as I love that hair! Doug, my colleague at Billings, Jay Wallace was a grad of SFTS and new Annie as well. Does she speak at the seminary now and then?